It's Memorial Day. Saying "Happy Memorial Day" doesn't seem quite right, since it's a time we remember those who have fallen and are thankful for the sacrifice that was made so we could live freely in this great land. I hope you all had a blessed time with family or friends and remembered the true meaning of the day while you ate your grilled hotdog. Last week, I mentioned a new adventure for our family and it entails putting our house on the market soon so I decided it was either now or never to get that home tour on the blog that I promised ya'll over a year ago! So far we have a photo tour of our master bedroom which I shared last week HERE. A lot of time and energy went into this gorgeous porch transformation by Glass Slipper Restorations. Love the color on the ceiling! D.D. 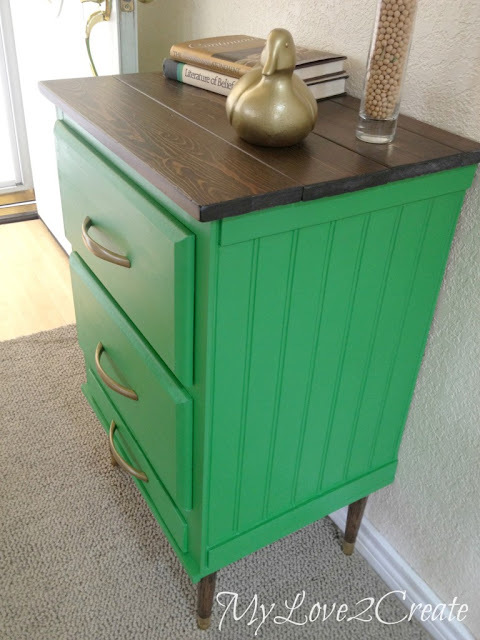 's Cottage made it hard to choose a feature since she linked up more than one stunning furniture makeovers! 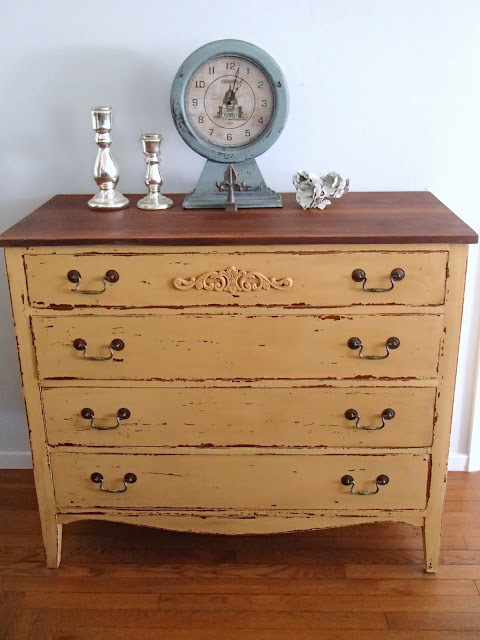 But this yellow milk paint from Miss Mustard Seed is just so perfect with that wood top, I went with this beauty. My Love 2 Create went the distance baby - in making an ugly, plain nightstand into something to behold! This is one of those must-click-over-and-sees! Thanks Kammy, love joining in with Trash 2 Treasure Tuesday Linky Party. Love joining in. Hi Kammy, hope you had a nice Memorial Day! There wasn't any grilling going on around here, we got 3" of rain ! Your Master Bedroom is Beautiful! Love those painted curtains! Thank you so much for featuring my Front Porch Restoration. And thanks for hosting this wonderful party! Have a great week! Thanks for the party and the feature of my yellow dresser! Hope you enjoyed your weekend- only rain here. Hi Kammy, hope you had a great memorial day weekend. Thanks for hosting the party and good luck with selling your farmhouse. As soon as time permits I'm heading over to see your tour! Thanks for the link party! I love your master bedroom tour. Its looking awesome. Kammy I love your master bedroom it is so beautiful!! You are so sweet, I really appreciate the feature!! Thank you so much! Thanks for a great link party!! Have a great week! !